Roger Federer’s much-awaited return from back injury was not an easy one for his large legion of fans. On Wednesday, his opening round clash with rising teen Taylor Fritz at the Mercedes Cup in Stuttgart was suspended because of rain. The former World No. 1 came back on Thursday to complete his win but not before experiencing some stressful moments. The gutsy 18-year-old American managed to take a set off the top seed before succumbing to a 4-6, 7-5, 4-6 loss at the hands of the maestro. The win, which was the 1,071th victory of Federer’s illustrious career, put him in the second place in the list of most match wins in the Open Era, tying him with the eight-time Grand Slam champion Ivan Lendl. He will next aim to add on to that tally when he takes on the German qualifier and former top 20 player Florian Mayer for a place in the semi-finals. The 17-time Major winner’s troubled back had forced him to pull out of the 2016 French Open – his first withdrawal from a Major since 1999. Earlier in the day, new top 10 player Dominic Thiem continued his fine form as he notched up his 42nd win of the year. 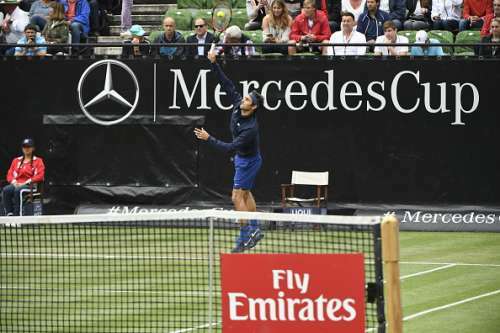 The third-seeded Austrian, who reached the semi-finals of the French Open, made a superb adaptation to grass as he withstood 21 aces from Sam Groth for a 7-6(3), 7-6(2) win. The 22-year-old will be next up against veteran Mikhail Youzhny, who beat qualifier Sergiy Stakhovsky 6-3, 7-6(1). Wildcard and former champion Juan Martin del Potro too impressed in his 6-4, 6-4 dismissal of Australia’s John Millman. This is the Argentine’s first grasscourt tournament since reaching the semi-finals of the 2013 Wimbledon Championships. He will next face the fourth seed Gilles Simon who needed three sets to prevail over local hope Jan-Lennard Struff 6-4, 4-6, 6-2. At 37, former World No. 4 Radek Stepanek is having a wonderful resurgence. The Czech, who took Andy Murray to five sets in the first round of Roland Garros, toppled the second seed Marin Cilic 7-6(4), 7-5 to set up a quarter-final against former runner-up Philipp Kohlschreiber. Federer, Nadal and Djokovic are ridiculously good, but are the Big 3 better than every other era in tennis history?